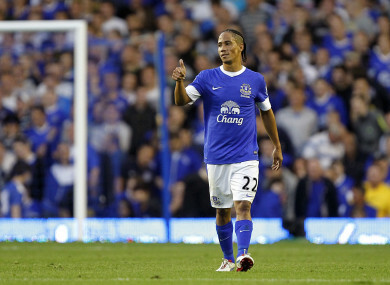 Pienaar enjoyed two spells with the Toffees. STEVEN PIENAAR HAS announced his retirement from professional football. At 35, the South African midfielder is calling time on a career that spanned 18 years — having most recently played for Bidvest Wits in his homeland. Born in Johannesburg, he caught the attention of Ajax Cape Town’s academy from a young age and went on to play two seasons at senior level with them before joining their parent club, Ajax Amsterdam. In a superb, young side that also featured the likes of Zlatan Ibrahimovic, Wesley Sneijder, Rafael van der Vaart, Nigel de Jong, Maxwell and Christian Chivu, Pienaar won two Eredivisie titles and two KNVB Cups under Ronald Koeman. He was signed by Borussia Dortmund as a replacement for Tomas Rosicky in 2006 as the Czech playmaker was departing for Arsenal. However, Pienaar only lasted a season in Germany and moved to Everton the following summer, initially on loan. It was at Goodison Park where he played his best football from 2008-2016, with the exception of one disappointing year at Tottenham in 2011. He left the Toffees to be reunited with former manager David Moyes at Sunderland in 2016 before returning to South Africa. A former captain of Bafana Bafana, Pienaar earned 61 international caps. An unused squad member at the 2002 World Cup, he featured in front of home fans at the finals eight years later. Email “Ex-Everton, Spurs, Ajax and Dortmund midfielder Pienaar hangs up his boots ”. Feedback on “Ex-Everton, Spurs, Ajax and Dortmund midfielder Pienaar hangs up his boots ”.